Why New? How did you choose? Why Iron Eagle? We anticipate this to be one of the most frequently asked questions by people considering a tiny home on wheels so we want to give a little in-sight into our reasoning, which of course, is not the rule, it is just what worked best for us at the time. I was heck bent on finding a used trailer for under $1,500.00 and if needed, performing some work to it to bring it up to par while Samantha was more interested in buying new as it provided peace of mind that our foundation was strong, certified and sketchy owner/unknown defect free. After a lackadaisical 2 month search for a used trailer, that route looked a little less promising and we sat down to re-evaluate our decision as we approached the 1 year mark until needing the tiny home to be finished. The reason for buying a used trailer in our eyes was simple, lower cost, but the reasons for buying new, Samantha insisted, far outweighed the negative of increased cost. We found that the peace of mind associated with purchasing a new trailer and being the sole owner was well worth it and made the entire process seem less daunting. Our trailer would be made of new materials and components ensuring, with regular maintenance, we should be good to go for quit some time. There would be no wondering if the trailers structural integrity, braking and/or electrical systems had been compromised in an unknown incident. And with any project there is always the chance that the “little bit of work” needed to bring a used trailer up to par turns from weeks to months and from a couple hundred dollars to a couple thousand resulting in long time drains and resulting in minimal savings at best, when all said and done. With that said, I am always in far or re-using something when possible! Rather than mentioning why we did not choose other trailer companies I would like to focus on why we did choose Iron Eagle, and there are two reasons. Location: Iron Eagle is located just outside North-East Portland, Oregon, only 3.5 hours from our home in Yakima, WA and the drive is stellar. Experience: If we were going to buy new, we were going to “do it right” and preliminary conversations with Rob at Iron Eagle Trailers were courteous, helpful and provided interesting insight into the evolutionary process of their many years of building tiny home specific trailers that had been repeatedly tweaked based on valuable feedback straight from tiny home builders. And not just a little feedback as Iron Eagle happens to be located near one of the most progressive epicenters of the Tiny Home movement and is the go-to trailer manufacturer for pioneer figures including Dee Williams, who has dedicated her life to educating and helping others realize their dream of designing, building and inhabiting a [tiny] home through Portland Alternative Dwellings. That’s right, there are trailers specifically designed and built for tiny homes, and not just a flatbed utility trailer you can get anywhere with a new label and marketing. There are two main styles of a tiny home trailer; one in which you frame the floor on top of the trailer and those which allow you to frame the floor “inside” your trailer. 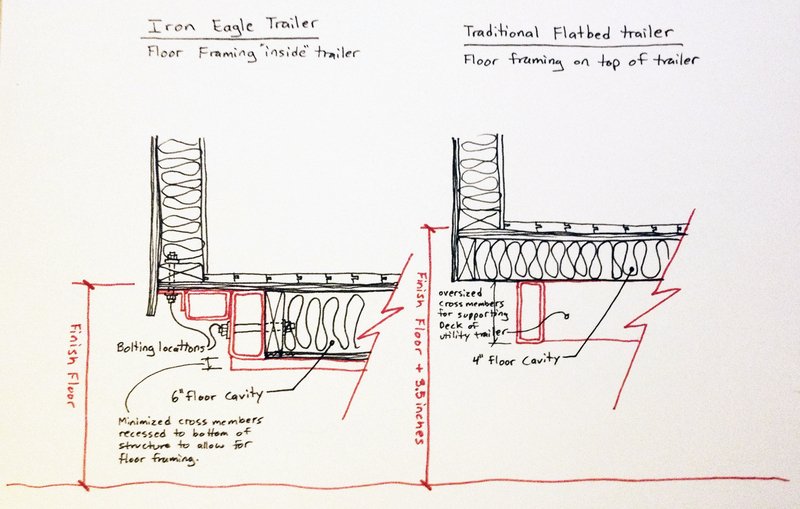 Iron Eagle designs a trailer meant to have the floor famed inside and below we will talk more about that and a few other key features that led to our decisions to go with Iron Eagle Trailers that we illustrated in the diagram above. It is built without the structural members and lumber that make up the deck of the trailer as it is not needed/wanted when used for a tiny home. This saves weight and the minimized cross members that are recessed below the main trailer structure creates a large cavity to frame your floor inside. This space is sized to allow a 2×6 floor framing provides a deeper cavity for more insulation while not subtracting from your overall headspace as would be the result of a 2×4 floor framed on top of the trailer. Taking 4-6 inches of valuable height from floor framing and being able to utilize it in your living space is the single biggest reason to choose a trailer in which you can recess your floor framing in the trailer, especially if you intend to have a loft! 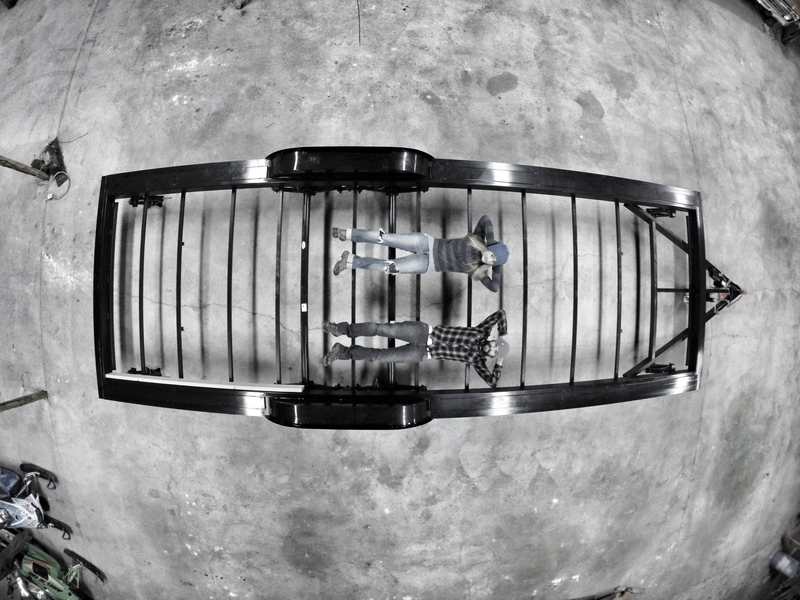 The trailer uses square tube steel and angle flanges on the two sides of the trailer to extend the buildable surface to nearly the entire 8.5’ maximum allowed width. THIS is where the single downfall of this trailer surfaces in my opinion, as a small thermal bridge is created at the edge condition of the wall between the floor framing insulation and the wall framing insulation. We decided the positives of this trailer far outweighed this single consideration and will be thinking of ways to remedy this. Pre drilled holes in the main rectangular steel member and the addition of an angled steel member around the perimeter of the trailer provide perfect locations to anchor your floor and wall framing directly to the trailer. Fender flashing installed along the curved contour of the wheel fender aids in water suppression at one of the most vulnerable areas of your tiny home. The following link takes you to their tiny home specific trailer and reiterates much of what has been mentioned in this post. Me and my wife we live in France close to Chamonix Mt.Blanc as Im originally european but wifey is from Spokane WA. We are planing on building a tiny house too once I get the “green light (card)” to get to the US. really enjoyed your “why Yakima” and the way of thinking: close to the ocean, BC, and both coastal and interior mountains…. We both have met at longboarding event at Maryhilll almost 3 years ago, when I lived in BC/Canada. I might ask few questions in the future, once we get closer to building a TH, since we will be living in the same climate. We have been to that long boarding event you speak of! Look us up when you settle down over here in Washington. We move in this January and should have lots of great feedback (posative, negative and otherwise) based on that experience.